Sept. 28, 2018–The following memorandum, currently being used in Northern Virginia for mobilization in Congress, provides an updated summary of the necessity for the reinstatement. The legislation currently before the Congress has 8 sponsors in the Senate (down due to the death of Sen. John McCain), and 57 in the House (due to resignations and one death of sponsors). We residents of Virginia request that our elected Representatives re-instate a 21st Century Glass-Steagall law, to protect the American economy and the Federal Budget. 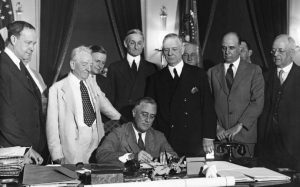 Glass Steagall was a bi-partisan, 37-page, populist, law signed by President Franklin Roosevelt in 1933, and actively promoted by powerful Wall Street bankers following the Crash of 1929 and closure of ALL banks. It worked by completely separating commercial banking, which is loan-making, from investment banking, that entails speculation. Throughout its 66-year history, Glass Steagall prevented ANY systemic banking collapse. Its dilution, and eventual repeal in 1999, led to the financial system collapse and Great Recession of 2008-09 that devastated the American economy, doubled the national debt, and took years from which to recover. Meanwhile, the Dodd-Frank Act of 2010 enacted after the crisis has been inadequate at reigning in Wall Street excesses. Today, five Mega Banks are so highly leveraged, so highly interconnected, and still holding assets in bubble territory, that a wrong bet by of any one of them could bring the entire financial system crashing down. That would result in even greater losses in: jobs, workers deposits, retirement savings, and government receipts than occurred in 2008. The recent passage into law of Senate Bill S.2155 (the “Economic Growth, Regulatory Relief, and Consumer Protection Act”), and prospects for an upcoming wave of corporate junk bond defaults, both increase the chances of another financial crisis with bank bailouts. Support passage in the House of either H.R. 790 (the original Glass-Steagall Act), or H.R. 2585 (a mirror of the Senate bill, with provisions covering modern derivatives). The Glass-Steagall Act prevented “the undue diversion of funds into speculative operations.”  Speculation refers to the use of depositors’ money buy stocks, bonds, today’s derivatives, or businesses through underwriting, with the hope that their value will rise, but with the risk their value might also fall. Commercial banks, that take in deposits and make loans to small businesses and households, could not use depositors’ money to speculate. To further protect citizens’ savings, Glass-Steagall created the Federal Deposit Insurance Corporation, to insure bank deposits up to of $250,000 (today’s maximum) in the event that one or more individual banks might fail. Investment banks, that create and hold derivatives, buy and sell stocks and bonds, and underwrite large financial deals, had to be separated into an entirely separate bank, with no common boards of directors, shared deposits, etc. If those banks failed, there would be no government bailout. Commercial banks could purchase securities for their clients, but not for their own account (i.e. proprietary trading, the subject to today’s Volcker Rule) reducing even the appearance of betting. Push to De-regulate Banks: In the 1980-90s, the wall between investment and commercial banking was dismantled, and banks were allowed to own brokerage firms and mutual funds, and act as both agent and principal in securities trading. In 1980, in the face of rising interest rates that reduced their profitability, Savings and Loans (S&Ls) were given permission to speculate, contributing to the failure of 1/3 of those institutions by the end of the decade, at a cost to taxpayers of $130 billion. 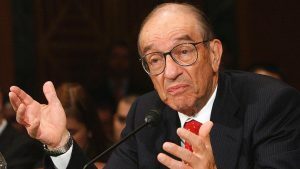 In 1987, Greenspan allowed Bank Holding Company subsidiaries to deal in derivatives; the need for a $3.6 billion bailout of banks that had lent money to the hedge fund, Long Term Capital, followed a decade later. In 1999 Congress repealed Glass-Steagall. Commercial and investment banks merged, and became Too Big to Fail Banks (TBTF). In 2000, Congress passed the Commodities Futures Modernization Act, deregulating derivatives. Thereafter, the issuance of derivatives (mostly mortgage backed securities associated with the housing bubble) soared, and banks and insurance companies competed to purchase them by increasing their leverage (or borrowing) from other banks. Thus, financial sector debt skyrocketed, from 25% of GDP to 125% of GDP between 1985 and 2008. And the interconnectedness-of-debt, and risk of systemic failure, rose alongside. The Great Recession of 2008-09: The system began to crash in the fall of 2007, as home mortgage defaults, short sales, and falling house prices, caused Citigroup’s toxic financial paper to tank. By October 2008, 12 of the 13 most important banks were “at risk of immediate failure”, according to Federal Reserve Chair Ben Bernanke, and were bailed out. The myth that the crash was caused by the implosion of investment banks not subject to Glass-Steagall is UNTRUE. Citigroup, e.g., ultimately received $45 billion in taxpayer bailout, $340 billion in asset guarantees, and $2 trillion in near-zero percent Federal Reserve loans. The recession’s impact on America was devastating: the economy contracted by 5.1%, 80.7 million jobs were shed, upwards of 10 million families lost their homes to foreclosure, the net worth of American households fell by 22%, the stock market lost 57% of its value, government debt doubled to $20 trillion (on account of low tax receipts and high unemployment claims), and the Federal Reserve, the Treasury, and the FDIC, spent an additional $5 trillion at public expense to keep the financial system afloat. 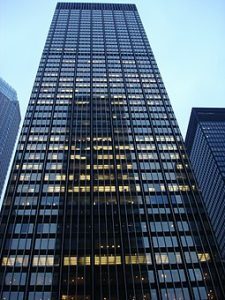 According to a 2015 report by the Office of Financial Research on the SYSTEMIC RISK imposed by US banks, the higher a bank’s leverage, the more prone it is to default under stress. And the greater its connectivity other banks, the greater is the risk the default will spread to other banks. That report identified five mega-banks with particularly high contagion index values — JPMorgan-Chase, Citigroup, Morgan Stanley, Bank of America, and Goldman Sachs. A default in any one could bring the entire financial system down. And that would overwhelm the capacity of the FDIC to protect citizens’ deposits. Added to the above, a “financialization” of America is crowding out the supply of money available to lend to America’s productive economy for real investment, thus slowing economic growth. The claim that the Dodd-Frank Act of 2010 has constrained the supply of money to lend is UNTRUE. JP Morgan-Chase, e.g., sits on $1.4 trillion in deposits, of which only $900 billion has been lent to the real sector. The rest has gone to speculate in derivatives and lending overseas, and more recently to buy back stock in order to boost CEO pay. The new threshold exempts 25 of the 38 biggest banks in the nation from enhanced capital and liquidity rules. These 25 banks hold $3.5 trillion, or 1/6 of the assets of the entire banking system, and received $47 billion in taxpayer bailouts in 2008. Moreover, among the 25 banks are U.S. holding companies of some of the most bankrupt, scandal-ridden foreign banks, including Deutsche Bank, BNP Paribas, UBS, and Credit Suisse. Deutsche Bank received $12 billion, and UBS received $5 billion, in U.S. taxpayer bailout in 2008. All 25 banks of these banks should therefore continue to be monitored on an enhanced basis as per pre-S.2155 law. The Act also exempts banks with less than $10 billion in assets from compliance with the Volcker Rule, which prohibits proprietary trading with a bank’s own funds. Just like the S&Ls that collapsed in the 1980s, these smaller banks can now engage in risky, speculative gambling – on hedge funds, derivatives, bitcoins, and other speculative ventures – with FDIC insured deposits. The National Association of Federal Credit Unions has called for Glass-Steagall. The Act does not fix systemic risks to community banks posed by the risky speculation of too-big-to-fail (TBTF) banks. Rather, the Act makes systemic risk worse, by weakening stress tests for regional AND larger banks, and reducing capital requirements for banks with over $50 billion in assets. In recognition of these risks, the National Association of Federally Insured Credit Unions recently called for the enactment of a 21st Century Glass-Steagall Act. Finally, S. 2155 removes the requirement of holding escrow accounts for home buyers with higher priced mortgages that fall below the $10 billion asset level. In addition, the Act exempts appraisal requirements for homes, including in rural areas, which could lead borrowers to purchase overpriced homes, with the result that they owe more than the homes are actually worth. The Financial Crisis Inquiry Commission, created by Congress following the 2008 crash to investigate its causes, cited a lack of escrow accounts, and appraisal fraud, as two major causes of the mortgage bubble and its subsequent demise. The assessment of the Congressional Budget Office is that this Act increases the chances of another round of bank bailouts. Sadly, as with the deregulation of S&Ls in the 1980s to allow speculation, this Senate bill sprang from bank lobbyists. An examination of donations to S. 2155’s sponsors shows that the banking sector figures prominently, often as the number one source for campaign contributions. Instead of S.2155, what is needed to restore a level playing field for small banks, and to free up investment funds for the real sector, is restoration of the Glass-Steagall Act. That legislation would completely separate commercial banking, which is loan-making, from investment banking that entails speculation. Under a Glass-Steagall regulatory environment, ALL commercial banks – including small and medium-sized ones – would be protected from Wall Street speculation, and the need for enhanced supervision would then be moot. Glass–Steagall legislation, from Wikipedia, the free encyclopedia. Savings and loan crisis, from Wikipedia, the free encyclopedia. Long-Term Capital Management, from Wikipedia, the free encyclopedia. Commodity Futures Modernization Act of 2000, from Wikipedia, the free encyclopedia. The Big Short, from Wikipedia, the free encyclopedia. Bernanke: all but one major firm at risk in 2008, by Dave Clarke, Kevin Drawbaugh, January 27, 2011. Great Recession, From Wikipedia, the free encyclopedia. Office of the Controller of the Currency, Derivatives Quarterly Report. Financial System of U.S. Rests on Health of Just Five Mega Banks, By Pam Martens and Russ Martens: July 6, 2017. Global Financial Stability Report April 2018: A Bumpy Road Ahead, International Monetary Fund, April 2018. IMF says debt binge leaves US corporate assets exposed — Global financial stability report warns of risks from US business loans, by Shawn Donnan and Gemma Tetlow, April 19, 2017. Moody’s warns of ‘particularly large’ wave of junk bond defaults ahead, by Jeff Cox, May 25, 2018. Beware the ‘mother of all credit bubbles’, by Steven Pearlstein June 8, 2018. How Wall Street is crushing Main Street, by Sean McElwee and Wallace Turbeville, March 27, 2014. 2017 Complete Annual Report – JPMorgan Chase. Senate advances bank deregulation bill as Democrats break ranks, by ZACHARY WARMBRODT, 03/06/2018. The Senate’s Dangerous Financial Deregulation Bill (S 2155), AFR Talking Points, by Americans for Financial Reform. 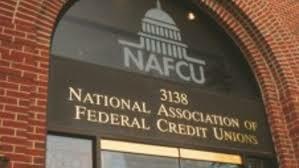 NAFCU Calls for Discussion on a Modern Glass-Steagall, Seeks to Reduce “Too Big to Fail”, by National Association of Federally Insured Credit Unions, September 05, 2018. Senate banking bill likely to boost chances of bank bailouts, CBO says, by Jeff Stein, March 5, 2018. The $24 Million Reasons Dems Back America’s Worst Banks, by Richard Eskow, March 13, 2018.